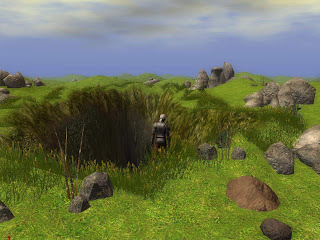 The World of Althéa: A Blast From The Past! Having the week off has allowed me to work with the NWN2 toolset more closely, and to start to understand the more nitty-gritty of its engine, as well as start to make more posts in the forums. Today, I decided to take a break from learning about crafting and its functions, but not before I made a post in the Bioware forums asking for more details on how distillable objects are set to be dropped from the various monsters. At first, I tracked down what I thought would be the answer from within the des_crft_drop.2da file, but having played the official campaign and collected such things as fire giant heads, I still cannot see how such things are determined, as this 2da file does not contain such information where I thought it would be. To date, I have not had an answer as to what actually does determine such drops. In the worse case scenario, I will write my own scripts to handle such matters. It would just have been nice to understand this a bit more first. 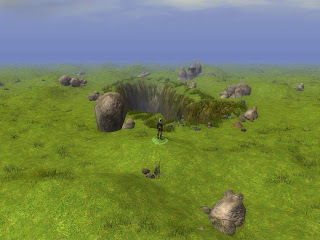 These images show the rift that opened upon the Borantan Plains near to the start of the game: The same rift that the heroes later descended and found their way to the Underdark, where they are still today. I was pleased with the results again, and I am beginning to see that some quite good results are possible, even with the minimal amount of skill. During my drawing of the new area, I had the urge to dabble with some campfires and to add some script that automatically changed their state (fire effect) according to the time of day. This highlighted a couple of issues itself. First off, I learned that Placed Effects (e.g. flames) are harder to work with (manipulate) than I first thought, and secondly, the SetTime function works very differently to how I first thought when the module Game Time has been altered. As you know, I intend to alter the flow of time from the previous 1 minute = 1 minute style of play to something that allows for real time waiting before spells can recovered from a rest. Originally, I proposed using 4 minutes = 1 Game hour, which equated to meaning resting would only be possible every 24 real time minutes (if within an area where you can rest). However, I am also considering higher values like 15 minutes = 1 Game Hour, as this would mean players would only be able to rest their PCs about once per gaming session (two hours real time), unless overridden by the DM for any reason. This would give more meaning to careful spell use and disposable magik items such as potions and scrolls, and even such items as wands, staves and rods. Anyway, during my use of the SetTime function, I discovered that setting the minutes higher than the module "minutes per hour" would alter the hour setting as if the minutes lapped the hour. i.e. Setting the module minutes per hour does NOT alter the flow of time to make 60 minutes now fit within the hour, but actually makes the hour comprise of the lower number of minutes. Therefore, in the module where the time was set to 15 minutes = 1 Game Hour, if I used the SetTime function to set 3 hours 59 minutes, this would actually set the game time to 6 hours 14 minutes (6.14 am) and not 3.59 am as you might expect. In other words, the 59 minutes are 3 x 15 minutes (hours) plus another 14 minutes. And when the clock that now says 6.14 am moves on one minute, the time would be 7.00 am and not 6.15 am.